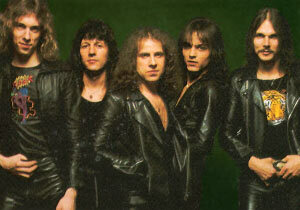 Scorpions Biography, Discography, Music News on 100 XR - The Net's #1 Rock Station!!! This band is the Germany's most successful Hard-Rock act of all time, with over 35 years of career and one of the biggest non-American bands that find multi-platinum success in the United States. All began in 1965 in Hannover, GERMANY, where guitarist+vocalist Rudolf Schenker, started up Scorpions, after several years of playing around his homeland with guitarist Karl-Heinz Follmer, bassist Lothar Heimberg and drummer Wolfgang Dziony, in 1970 the younger Schenker brother, Michael, joined as lead guitarist replacing Follmer, soon after Klaus Meine became the new lead singer. Two years later the group released their debut album, "Lonesome Crow" which was practically the soundtrack to the movie called "The Cold Paradise". In 1973 Michael Schenker quit and Ulrich Roth replaced him as lead guitarist, also Heimberg was replaced by bass player Francis Buchholz. 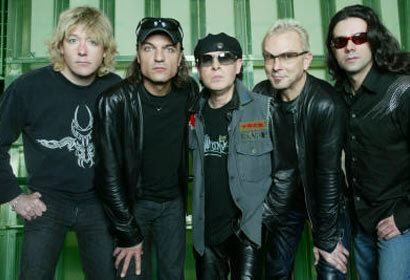 The following year, with a revamped line-up, Scorpions issued its second album: "Fly To The Rainbow". The rest of the '70s were marked by a string of releases, such 1976's "Virgin Killer" on which appeared Belgian drummer Rudy Lenners; with its sexist album-cover, the record was banned all over the globe, but became their first Japanese gold disc. Lenners was fired and replaced with Herman Rarebell shortly before the band began work on 1978's "Taken By Force". That same year the group undertook their first tour of Japan, shortly afterwards Roth left the band and Michael Schenker returned to the fold. The subsequent album, "Lovedrive", was recorded with guitarist Matthias Jabs who later replaced Michael Schenker, Scorpions supported the album with its first American tour along with Aerosmith, Ted Nugent and AC/DC, eventually "Lovedrive" cracked the U.S. Top 200 LPs & Tapes chart and entered the top 40 in Britain. 1980's "Animal Magnetism" rose to #23 in U.K. Official Albums chart and hit #52 in U.S. pop chart reaching the gold status. 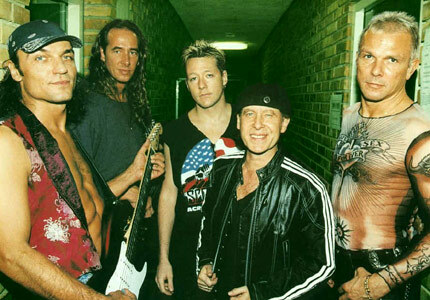 The band was forced to delay the release of their next LP because Klaus Meine lost his voice, after lengthy vocal retraining and two operations on his vocal chords the lead singer back into the studio with his bandmates to record the breakthrough effort "Blackout" which climbed into the top 10 of the official U.S. Pop Albums chart and went platinum, the record spawned their first American Pop charting single, "No One Like You", the track made an impressive impact at radio and peaked at #1 on Mainstream Rock chart; "Blackout" was also a big hit in Europe where reached the #11 in Britain. The follow-up, "Love At First Sting", was issued in 1984 and quickly hit #6 on The Billboard Top 200 Albums chart, it smashed into the top 10 of several European charts; its first single, "Rock You Like A Hurricane", reached the #25 on The Billboard Hot 100 and the subsequent single cut, the masterpiece "Still Loving You" helped pump album sales to double-platinum in the States. The next year saw the release of the live set "World Wide Live". After two-years hiatus, Scorpions resurfaced in 1988 with "Savage Amusement" which peaked at #5 on Billboard's Top 200 list, the single "Rhythm Of Love" hit #6 on Active Rock chart. That same year the five-piece outfit became the first international Hard-Rock band to play in USSR, with ten concerts in Leningrad for 350,000 Soviet fans. In late 1989 they released the collection "Best Of Rockers N' Ballads" which contained the Active Rock top 5 cover-hit-single of The Who's "I Can't Explain". In 1990 the quintet released "Crazy World", the record immediately became their best-selling album to date, highlighted by the single "Wind Of Change", a power ballad that capitalized on the fall of the Berlin Wall, it reached the #1 in 11 countries; in the United States this single hit #4 on The Billboard Hot 100 and #2 on Mainstream Rock chart, the album peaked at #21 on The Billboard 200 and generated three more Mainstream Rock top 20 hits: "Tease Me, Please Me", "Send Me An Angel" and "Don't Believe Her". The next year the members of the band were invited to the Kremlin to meet Mikhail Gorbachev. Scorpions returned to action in the spring of 1993 with "Face The Heat", it didn't rise higher than #24 in U.S. Top 200 and spawned the Active Rock top 10 hit single "Alien Nation" plus "Woman" and "Under The Same Sun" which peaked respectively at #15 and #16 in the same chart. In the spring of 1995 appeared the live-compilation "Live Bites" which included three previously unreleased tracks including the single "White Dove". 1996's "Pure Instinct" saw a marked drop in sales, its single "Wild Child" reached the #19 spot on Mainstream Rock Tracks. Three years later "Eye II Eye" missed the American charts, "Mysterious" was a minor hit on Billboard's Active Rock chart. In August of 2000 the veteran Hard-Rock band released an album entitled "Moment Of Glory" recorded with the Berlin Philharmonic Orchestra. In the summer of 2004 Scorpions resurfaced with an album of all-new-material, "Unbreakable", which featured the single "Love 'Em Or Leave 'Em". The German Hard-Rock superstars are out with their new album, "Humanity Hour I".